Customizing charts in Excel for Mac 2011 is fun — after all, you have loads of combinations to experiment with. To use the Excel tools in Office 2011 for Mac, be sure to click the chart’s border to select the chart before applying the tool. Change the chart type. You’ll want the chart type that displays your data in the most effective visual format. On the Ribbon’s Charts tab, find the Change Chart Type group and try various chart types by clicking the buttons. Some chart types, such as financial charts, require data to be in a specific arrangement. Check Excel help for details. Change the chart layout. The next stop is the Chart Quick Layouts gallery on the Ribbon. Click different layouts to see how they look. Click the scroll buttons at each end of the gallery, or click the “sweet spot” at the middle of the bottom border to display a drop-down gallery. Some layouts include chart titles and other data labels, which are text boxes you can type in to customize your chart. Apply a chart style. 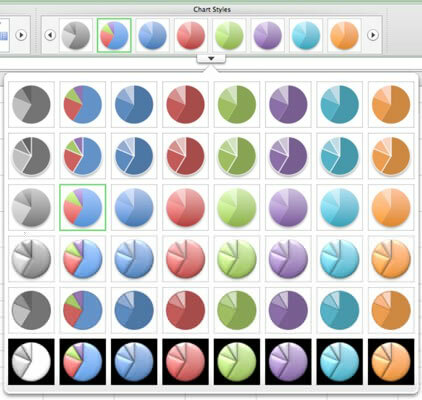 The Chart Styles gallery on the Ribbon has intriguing and beautiful styles based on the theme applied to your workbook. The icons that are available vary by chart type. By the time you make it this far with chart formatting, most of the time we think you’ll have found the perfect chart for your data. Of course, that doesn’t mean you have to stop here. You can continue customizing your chart to perfection.